Beautifully decorated and furnished city centre apartment. The apartment can sleep 4 adults comfortably or a family of 2 adults and 4 children. The apartment does not accommodate parties of 5 adults or more. By way of definition, a child is defined as under 12 years old. Comprises of 2 large bedrooms with large comfortable double beds, a sofa bed is available in one of the bedrooms which can accommodate 2 children or 1 adult (sofa bed is 120cm wide when fully out as a bed), 2 bathrooms, kitchen/living area and a balcony. Apt. is fully supplied with everything you will need (special requests facilitated if possible) - towels, linen, 'welcome pack' on arrival (containing some of essentials you will need - like dishwasher tablets, some washing tablets for clothes, milk, tea, coffee, spices for cooking). Apartment is in a very secure block - has 24hr concierge service and security. An underground parking space is available and included in the price. There are books and DVDs available to use in the apartment during your visit. A baby cot and high chair can be provided on request and we can probably rustle up a few toys for toddlers to save on your packing. Can arrange babysitting if required. Shopping: O'Connell St, Henry St and Grafton St are all within walking distance and have great shopping. The Jervis St Centre off Henry St and Henry St location in general has many high street shops. Arnotts Department Store on Henry St is a good stop too. Lovers of 'vintage' clothing may find a shop or two around Temple Bar but also try 'Jenny Vander' on Drury St. Grafton St area again has many high street names and is home to the more up market Brown Thomas department store. Keen shoppers should definitely make a trip to the Dundrum Shopping Centre (you can get the Luas from St Stephens Green - it takes 20 min on the tram and you will want to spend a few hours at least there). Shopaholics may want to venture even further and visit the Kildare Village Outlet centre - take a look at their website, buses leave from the city centre daily and the trip is around 45min. Antiques lovers should take a stroll down Francis St which is home to Dublin's antique quarter. The main double room has shower room with toilet attached. There is a main bathroom also with full bath/toilet/shower. Happy to provide additional facilities upon request and if possible. Ladies, there is a hair-dryer and hair straightener in the apt so no need to worry about packing it! There are lots of DVD's (adults and children) available to watch and a number of books. A 'welcome pack' is provided on arrival to include some of basics to get you started. Smoking is not permitted in the apartment but there is a balcony outside where smoking is permitted. Babysitter can be arranged. 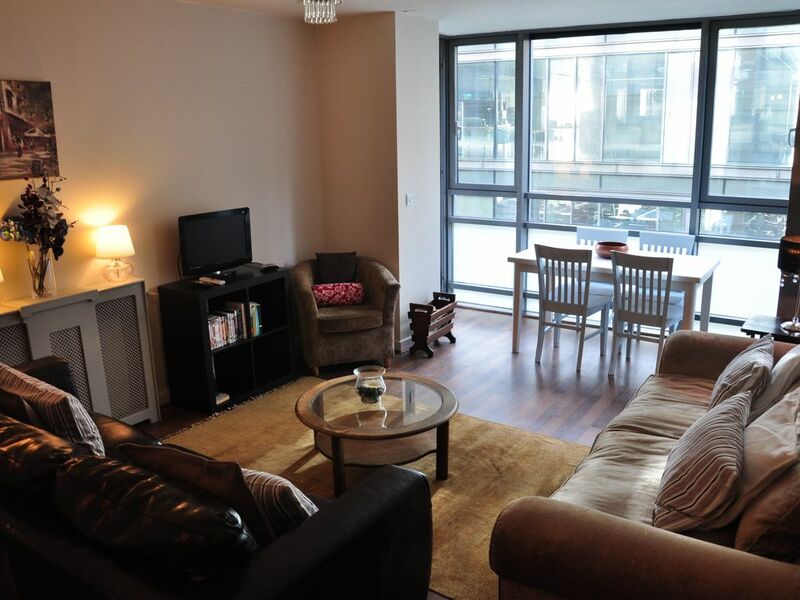 Great location; easy to get around Dublin; good restaurants within walking distance. A bit odd to be facing an office building across the courtyard but since we were gone all day it wasn't that big an issue and when we were back in the evening, the offices were closed. Would definitely stay again if I'm ever lucky enough to return to Ireland. This rental worked well for two couples visiting Dublin. It is walking distance to several coffee shops, restaurants, pubs and a grocery store. The Luas and Hop-on Hop-off stops are very nearby. If you prefer to walk, it only takes about 20 minutes to get to the city center. Great time was had by all! There was some problems with this condo. The TV never worked, it had a washer and dryer combination which we got to wash but could never get it to go into the dry cycle. There wasn't any outlets in either bathroom so to blow dry your hair, you had to find other outlets with no mirrors. The condo was outdated in some areas. Curtains in bedrooms were awful and the one other problem was that when showering the second bathroom kept running out of hot water. We are sorry you did not bring these problems to our attention but glad you enjoyed your visit to Ireland and Smithfield. The TV is in full working order, unless the service provider might have had an outage. As is the washer dryer. The dryer is a bit tricky so instruction manual needs to be referred to, I can never remember how to use it myself without referring to the manual. Had you brought these items to our attention, someone would have been with you within 24 hrs. Thank you, we do need to get some mirrors for the bedrooms which I had forgotten about. We do not have power sockets in the bathrooms for health and safety reasons. We did have a free standing mirror in one of the bedrooms but it recently went 'missing'. I am sorry but curtains are a matter of taste, nobody has referenced them before. I have exactly the same ones in of the bedrooms in my house. I haven't received any complaints about the water since your visit but I will have it checked out for sure. Right in the centre of Dublin city and within walking distance from some great attractions - Old Jameson Distillery & Tower, Guinness Store House & Museum, Collins Barracks (part of National Museum), Christchurch Cathedral, Dublin Castle, Temple Bar, Chester Beatty Library all within very close walking distance. The LUAS (tram system) stops directly at Smithfield as does the Dublin Open Top Bus Tour. Also within walking distance are O'Connell St, Henry St, Grafton St (all shopping locations), The Phoenix Park (and Dublin Zoo), Hugh Lane Art Gallery (Parnell Sq). Kilmainham Gaol (famous historical disused prison) & The Museum of Modern Art are two tram stops away. Dublin Airport is 8kms, close proximity to main train stations. Large supermarket located below apt complex, leisure centre, cinemas close by. Local bars - Cobblestone Bar is famous for traditional music. Dice Bar a 'hidden' favourite hip and trendy Dublin bar and worth a visit if you can squeeze your way in at weekends.